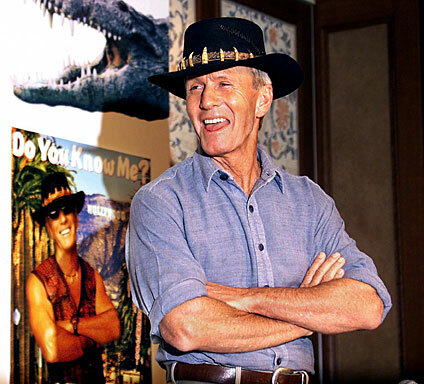 NEW YORK (CBS) Paul Hogan, the man who put Australia on the map - cinematically speaking - has been grounded in his native country and is not allowed to return to the United States until he pays a multimillion-dollar tax bill. Hogan, the star of "Crocodile Dundee" - returned to Sydney last Friday in order to attend the funeral of his 101-year-old mother. The 70-year-old comedian was then prevented from boarding his return flight because of a prohibition order from the local taxman, reports RadarOnline.com. The order prevents Hogan, who was served with a bill last month for tax on $37.6 million of undeclared income, from leaving Australia until he has paid for his alleged tax debts or until he has made arrangements for the tax liability to be discharged. Unfortunately, Hogan is not taking his dilemma lightly. Hogan's lawyer, Andrew Robinson, says the Aussie actor who now lives in California with his American wife Linda Kozlowski and their 12-year-old son Chance is "disappointed" that his own Government would treat him as a flight risk. "The family is very upset," he told an Australian TV network. "Paul's wife and son are in California, not knowing whether they got to upend their life and think about moving back to Australia or what they are supposed to do." His lawyer also said that Hogan, "doesn't have the ability to pay the amount that is currently being claimed." Hogan, who was born in New South Wales, Australia, starred in Crocodile Dundee in 1986, for which he won a Golden Globe for best actor.